The Quran and the Sunnah of Prophet Muhammad are the two divinely revealed sources of Islam, and on them the Islamic faith and worship are based. Someone might think, ‘Why is it important for a new Muslim to know about this topic?’ First, because knowing at least the basic information would increase his faith and confidence that he is on the straight path. He would feel his religion is not built on mere claims, but on revelation that Allah promised and actually preserved. Second, a person armed with basic knowledge is less likely to get affected by any doubts he will come across. Let us see evidence of how it has been preserved through the ages. 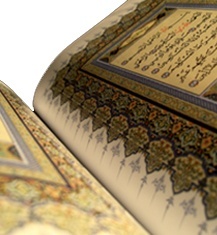 The Quran has been preserved and transmitted like no other religious text of the world. It was transmitted primarily by memorization and in writing as we will show. At that time, there were no printing presses. Books had to be written manually by specialized scribes and making a copy required a similar effort. The Quran was dictated word by word and letter by letter by the Prophet himself to specialized scribes. The Prophet passed away in 632 AD. Afterwards, Abu Bakr, the first leader of the Muslims, gathered the original scripts of the scribes into one book, and then some time later, when the Muslim empire stretched from East to West, Uthman, the son-in-law of the Prophet and the third Caliph, ordered five copies of the original to be made and distributed to all parts of the Muslim world some twenty years later. Today, we have three manuscripts of Quran which are traced back to the Prophet’s son-in-law, the Caliph Uthman. Figure 1 This manuscript, held by the Muslim Board of Uzbekistan, is the earliest existent written version of the Quran. It is the definitive version, known as the Mushaf of Othman, superseding all other versions. Image courtesy of Memory of the World Register, UNESCO. Figure 2 The Holy Quran of Othman in its glass-fronted safe. Image courtesy of Memory of the World Register, UNESCO. (2) The Topkapi Palace Museum. (3) The third manuscript is kept in Al-Hussein Mosque, Cairo, Egypt and can be seen below. Figure 3 An Early Quranic Manuscript At The Al-Hussein Mosque, Cairo, Egypt. Image courtesy of http://www.islamic-awareness.org. First, the Quran is memorized by a child, males and females, at a fairly young age. The process usually takes 2-4 years. Second, just memorizing the Quran is not sufficient. Quran is not just words, but sounds and meaning also. The Quran, must be voiced exactly the way it was read by Allah’s Prophet 1400 years ago. It has to be recited the way it was revealed by Allah. This is done by a rock-solid 1400 year old tradition of mastering the rules of recitation (tajweed) at the feet of a master who in turn acquired the knowledge from his teacher, an ‘un-broken chain’ going all the way back to the Prophet of Allah. The process usually takes 3-6 years. After mastery is achieved and the recitation checked for lack of errors, a person is granted a formal license (ijaza) certifying he or she has mastered the rules of recitation and can now recite the Quran the way it was recited by Muhammad, the Prophet of Allah. Not only the words of the Quran have been preserved, but the original sounds of those words have been preserved as well. No other religious text has been preserved in a similar manner – a claim any objective reader can verify for themselves. Thus, the Quran stands inimitable in its mode of preservation over the centuries as prophesized and promised by Allah Himself.